We had to pick a dish to bring for the work potluck. I chose potato salad, because it was easier than telling work I don’t like them and refusing to play. So we decided to spice things up and make a potato salad that nobody on the planet had ever had before. Cube the potatoes to a size you like and then wash them in a colander to get the starch off. In a large mixing bowl douse the potatoes with the vinegar, garlic, juice of half the lemon, salt, pepper, paprika, and olive oil. Cut the garlic to a size you like. I minced it because you never know how much folks do or do not like garlic. But, if I’d been cooking for myself I’d probably just leave the garlic cloves whole and roast them as is. Make sure you mix up the bowl really well. You want the paprika, vinegar, and olive oil to really coat all the potatoes. After that, aluminum foil on a baking sheet and bake them. Do not pre-grease the aluminum foil. As you stir them yes, they may tend to stick to the foil so don’t make the mistake of not stirring them at all during the roasting. You want the potatoes to be brown but not overly done, just slightly still firm. It’s potato salad and not true fully roasted browned potatoes. You’ve got regular old bacon and hard boiled eggs which are staples of many potato salads. I add caramelized onions because I love them and want to share that love with all humanity. When you’re done making the bacon, eggs, onions, and potatoes, it’s time to mix it all together with the remaining ingredients. Use whatever mustard and mayo you prefer. The sriracha is flexible with another hot sauce if you want. Go with what you like. But please put some kind of sauce in there because it’s money and not boring. The capers add a nice extra touch for my taste. If you don’t like capers, you can skip this part. As with before, make sure you really get a good mix in the bowl so all the sauces coat the potatoes all over. You can serve this immediately while it’s hot, or chill it and serve later cold. Be advised, this will not really keep in the fridge for more than about two or three days. After that time, the moisture starts to separate from the potato mixture and the salad becomes dry and tough. This is easily tackled by reheating the mixture in the microwave for about a minute to loosen it up again. But, generally speaking, I’d eat it all within two days for max tastiness. Life is full of risks. If you take upon your shoulders the profession of Bear Baiter you should expect some high medical insurance premiums. But if you post an unfavorable recipe on your degenerate blog, oh well, you’ll live. However many years I didn’t post any of my cooking here was due to many things, timid behavior, failure, laziness, whatever. Only a handful of recipes have gone up, all I’m rather proud of. I’ve still got many more of those. But how about one (of many) I’m not too sure of? It’s all good. It is what it is. It’s food, it’s good, so who cares if it’s not necessarily indescribably great. But seriously it’s still good stuff. I hate boring salads. There’s no point. You can get nutrition in so many awesome ways. Who wants to get their daily greens via apathy? Not me. On the other hand, places that charge their customers $11 for a lunch salad should be firebombed. It’s just salad. So we built this exciting main dish salad you can make on a weeknight in less than a half hour. If nothing else, it’s not boring. Whether all the freaky flavors in here will excite you or drive you away is entirely dependent upon your palate and preference. For us, I dig this kind of stuff, so badly. Just get a big bowl and toss the greens, broccoli, carrot, and apple in there. Chop them as you please. 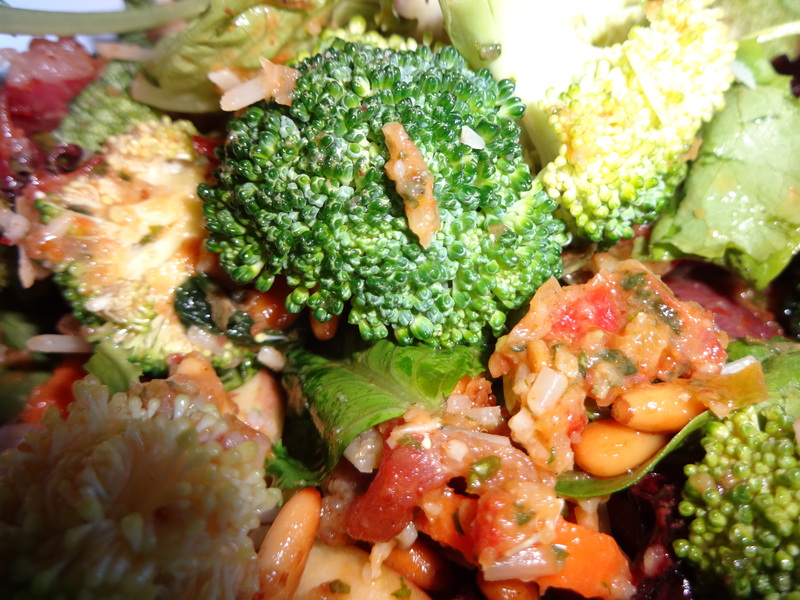 Feel free to substitute any fruit or vegetable you desire in your salads or to add more. It’s all good. But have at least three fruit or vegetable options in addition to the greens. The star of this dish is the vinaigrette and this sauté pan is your tool. You’ve got your shallots and peppers to brown as you desire, then the sun dried tomato and anchovy to provide some added bite. White wine deglazes, and the lemon juice to somewhat even it out. Cherry peppers have some high heat, you can use jalapenos or even regular bell pepper and it’s fine, just cook them a bit longer until they’re soft. You want almost all liquid gone but no overly dry. Process or blend it all up with the sherry vinegar, mustard, basil, and pepper. Do not, please do not add any additional salt. The anchovy already has your back on that. If you left the anchovy out because you don’t like the fishy taste or whatever, you add some salt then. If you don’t want to dance with sherry vinegar, use red wine vinegar. You should have a nice dressing at this point. If it’s too thick, add just a touch of water and blend again. If it’s too loose, you can add a bit more mustard, or just leave it. As long as it can coat your vegetables you’re good. Oh but we’re not done yet. 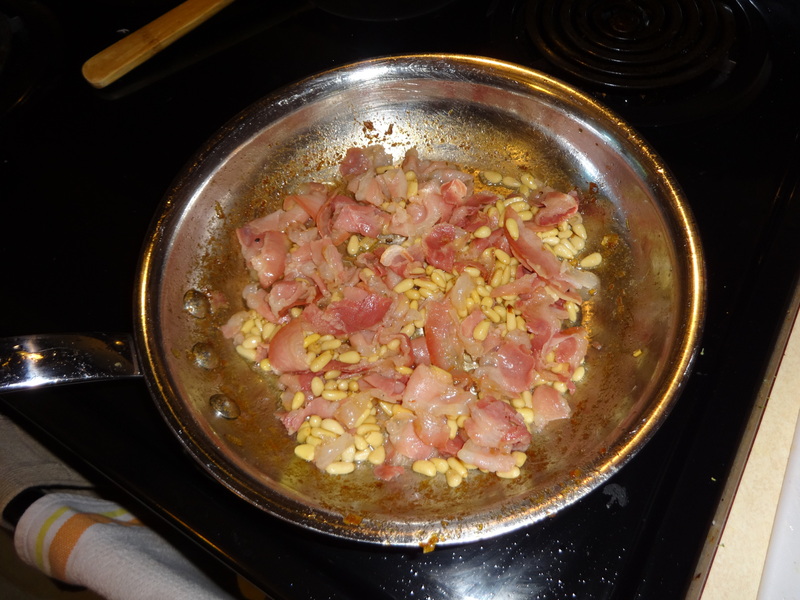 Because who doesn’t love bacon and pine nuts? I mean, I guess there might be somebody, somewhere who doesn’t. If so, they’re probably aliens, report them to the authorities. 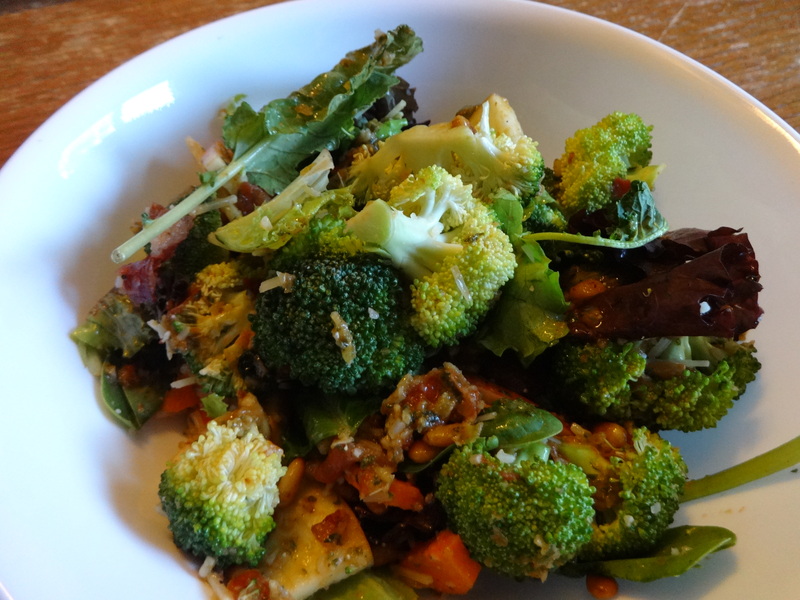 Toss the vinaigrette in the large bowl, add in the pine nuts and pancetta, sprinkle over the parmesan and go. No matter what happens, one way or the other, you’ll not be bored. Everything is apparently fake nowadays. The news is fake, science is fake, happy cat videos are faked, celebrity births are fake, and so on. So we decided to get in on the action, with this fake smoked salmon sandwich. It’s not actually smoked, but it’s ability to fill your body with delicious food will surely be the most realistic part of your day. So climb aboard our mystical journey, in a life where apparently nothing is more fake than the quest to determine your place in this currently destructive world. Wait, what? Let’s begin! After you’ve mixed up the spices, pat them into the salmon. The oil and lime juice you’ve brushed it with will allow the grains of goodness to stick to the salmon flesh. Smoked paprika is the top ingredient here. I’ve used paprika since the beginning of my cooking journey but have only recently discovered smoked paprika. It has so many delightful uses. After 15 minutes in the oven the salmon is mostly cooked, but we now open the foil to expose it to the increased heat. This will allow your spice blend to brown considerably. Note the difference visually, I assure you the taste difference is even better. Salmon is just about the most criminally easy thing to cook. So quick to do, and yet so delicious. I get the idea that salmon was one of those softballs God tossed to humanity after creation. We basically got left with war, pestilence, turmoil, and an ingrained desire to destroy ourselves. So God was like: oh, sorry, eh, uh, hmm, okay, here’s salmon. The mayo gets mixed up briefly with the capers, dill, and lime juice. The onion is extra credit, you don’t need to do it if you don’t want. The greens and tomato just get thrown right on there. Use your bread of choice. I went with sourdough, but any good bread will do. Just flake the salmon to fit the size of the bread. It’s a quick dish for a weeknight, that’s mostly healthy, and well worth your time. When you throw three different kinds of mushroom into a dish, the only question that comes to my mind afterwards is why didn’t I use four? Soak the dried porcini mushrooms in the chicken broth, then strain and chop them after about 20 minutes of hanging out. Keep the chicken broth, we’ll use it’s mushroom infused tastiness later. Sausage improves any dish. I shall duel anybody who claims otherwise. But honestly, this is just extra credit. The dish will do just fine without the sausage if you want to go the meatless route. Whoever discovered the concept of slowly caramelizing onions should have been appointed Emperor of All Humanity for at least one day. After you’ve added the other mushrooms, garlic, and the spices, you really want them to get a nice golden brown look throughout. As they start to stick to the pan, this will help give it a nice deeper flavor. Then we use the dry sherry to deglaze the pan and start the sauce. You can use white wine instead of sherry if you want, but really you should go with sherry if you can get it. It gives the dish a unique flavor. And if you take the trouble to buy it, try and get the better sherry that is like $20 a bottle. It’s remarkably better than the $10 bottle. While you’re cooking the pasta, slowly reduce the cream until you’ve got a nice, deep sauce. The recipe calls for pappardelle, but any long pasta of your choice will work great. You can eat this by itself or serve with a side salad. Either way works, but most people would like to have the salad with it too, as the dish can be a bit heavy for some folks. Most of my recipes come straight from my silly brain. But where I am inspired to steal the ideas of others, I shall always try and give credit where credit is due. In it’s original form, years ago, it was based on this decent Giada De Laurentiis recipe. But it evolved after I had the Pappardelle con Funghi e Capesante at Vigiluccis in Coronado. Work made me go there with the bosses, the food made up for the otherwise weird evening. It was one of those moments where you eat something, and you’re like, “I wonder if I could do that?” So I did. But theirs is much, much better than mine.